This 6' ft Santa Claus Riding In Gingerbread Sled Light Up Christmas Inflatable By Comin™ makes an eye-catching outdoor lawn decoration. It's simply the perfect combination between simplicity and bold, with the two complementing each other perfectly. Added on is the wear-proof design, which improves the ability to last. Christmas is fast approaching, and it's time to prepare for Santa's grand arrival. This year, in favor of his traditional reindeer sleigh, he has opted for a more techy ride. With an animated helicopter sleigh, he is ready to touch down on every single rooftop. His personal chauffeur is a gingerbread man, and what's even better, his ride is made of gingerbread and candy canes too. 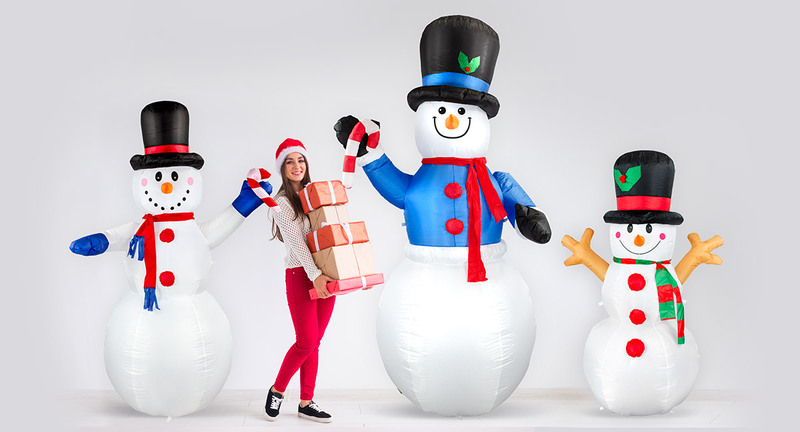 This high-quality inflatable decoration is sure to put a modern spin on traditional Christmas decorations. It's easy to set up for indoor and outdoor use. Within a few minutes, Santa will be right on your front porch.